Women who made their living practicing dentistry, historically a male-dominated field, faced and conquered much to take their places beside their male counterparts. From stereotype-breaking practitioners to women-inventors, the female pioneers of dentistry had great influence in shaping the medical field we recognize today. The earliest official female dentists practiced in Sweden, including a young Jewish woman named Amalia Assur. She gained special permission from the Swedish Royal Board of Health in 1852 to practice dentistry, even though the profession could not legally allow women to do so. A mere three years later, Emeline Jones launched her own career in the United States, despite her husband’s misgivings. Like many other physicians at the time, Dr. Daniel Jones considered women unsuited to the detail required in dentistry. After studying for years in secrecy, filing and extracting hundreds of teeth in preparation, Emeline Jones was finally allowed to assist her husband in his practice. She later opened one of the best dental practices in Connecticut in 1876 and worked there until her retirement in 1915. Some women not only practiced the art of dentistry, but also sought to improve upon the medical field. Although their inventions may not seem particularly unique or ground-breaking, these women still represent some of the most important female innovators of the time. We know very few details about the earliest female inventors because of the difficulty in documentation. 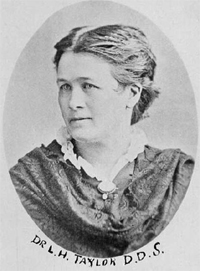 For example, Tabitha Babbitt is often credited for formulating a better way to make false teeth. However we know little about her specific methods. Likewise, we know little about Mary Ann Boughton’s contraption to make better air chambers on dental plates. All we have is the description in her patent of the technology. However, we do know more about the recent inventions with proper documentation. One of the most prominent female figures in dental history is Elizabeth Morey. She is known for inventing the idea of a dental cap (a fake tooth fitted over a damaged tooth to maintain an even bite). But her progressive philosophy about what dentistry should be is even more influential. Unlike many of her male colleagues, Morey greatly advocated gentler dental practices and sought to save teeth when problems started to manifest. She avoided extracting and crushing teeth whenever possible, even without yet understanding all the complications that could arise from pulling teeth. Many modern dentists adopt her philosophy and work to retain as much natural tooth structure as possible. Above Dental is proud of honor all these women during Women’s History Month who have braved a career in dentistry despite the odds.